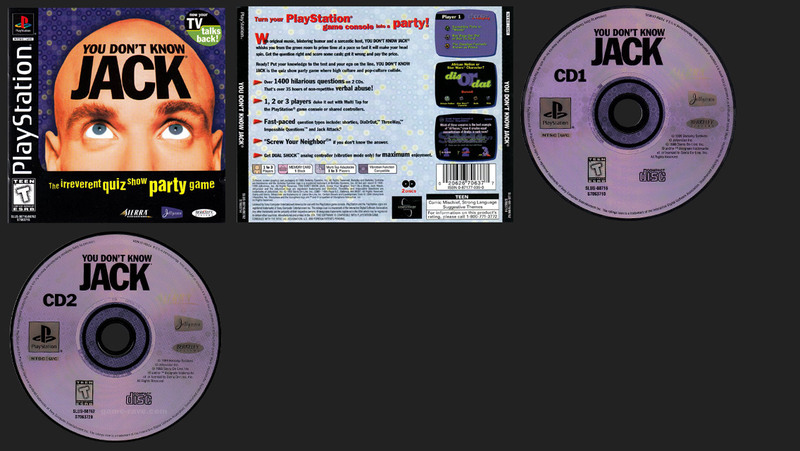 Turn your PlayStation game console into a party! With original music, blistering humor and a sarcastic host, YOU DON’T KNOW JACK whisks you from the green room to prime time at a pace so fast it will make your head spin. Get the question right and score some cash; get it wrong and play the price. Ready? Put your knowledge to the test and your ego on the line. YOU DON’T KNOW JACK is the quiz show party game where high culture and pop-culture collide. Over 1400 hilarious questions on 2 CDs. That’s over 35 hours of non-repetitive verbal abuse! 1,2 or 3 players duke it out with Multi Tap for the PlayStation game console or shared controllers. Fast-paced question types include: shorties, DisOrDat, ThreeWay, Impossible Questions, and Jack Attack. “Screw Your Neighbor” if you don’t know the answer. Get DUAL SHOCK analog controller (vibration mode only) for maximum enjoyment. Originally a PC game, ported over.